The sample deposit receipt template is the perfect option you have to maintain a record of the total inflow of funds and also the details of the individual deposit amounts. These free Sample Receipt Templates can also be downloaded very easily. They come in different formats and the users can also add details of the names of the clients, the account numbers and the date of deposit. This is a template has a very neat and clean format. 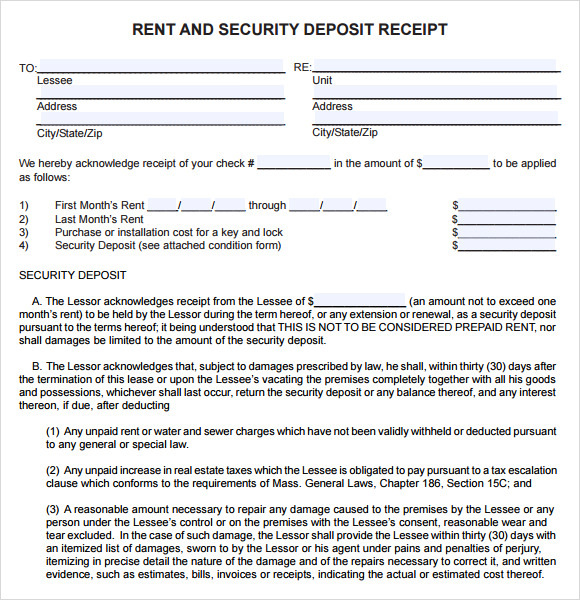 The user can add various types of information on this template such as the date of transaction, the name of the tenant, the amount, the name of the owner of the rental premises etc. This template follows the pattern of a typical ledger format. It contains the places where the user can feed in the information of the date of the transaction, the description of the cheque. The amount specifications are also provided along with the dates of the arrival, departure and also the room type. There are spaces where the guest and the cashier can provide their signatures. This template is print ready. This is a very neat and professional looking template. It has been divided into six columns that contain information related to the fund amount, the name of the organization, the account number, the activity type, a column of cash or check from and also a column telling the amount. 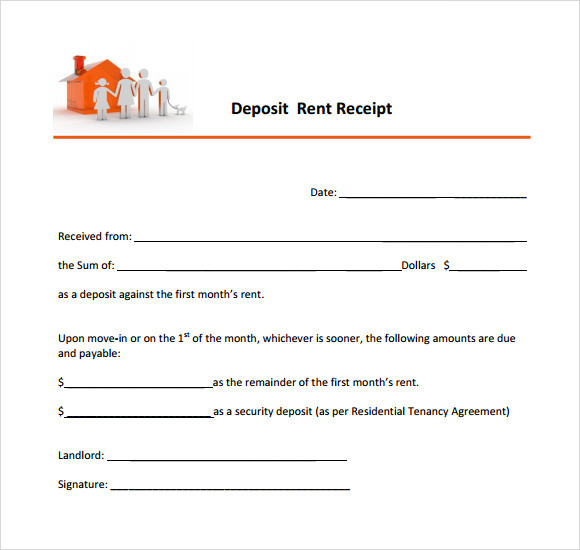 This template is the perfect layout to record the details related to the aspect of rent deposit receipt. This template layout provides for the date of transaction, the name of the party making the payment, the exact amount of the payment made. This layout also provides for the amounts that are due and needs to be paid and also the amount that has been kept as security deposit. 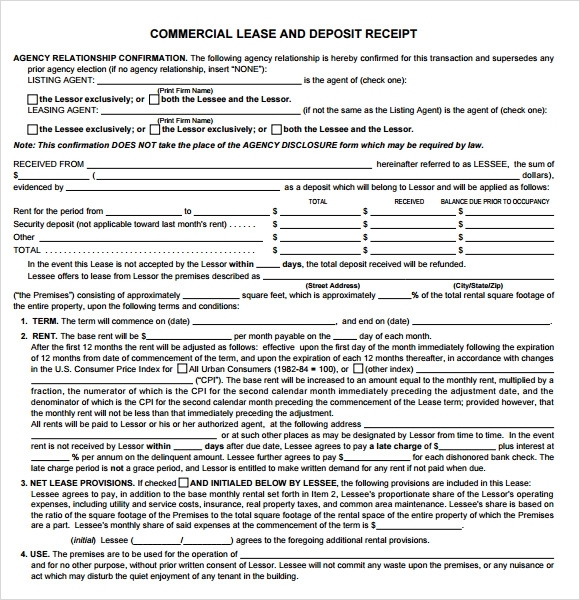 This template provides the user with a huge number of details that are there pertaining to the commercial lease and deposit receipt. 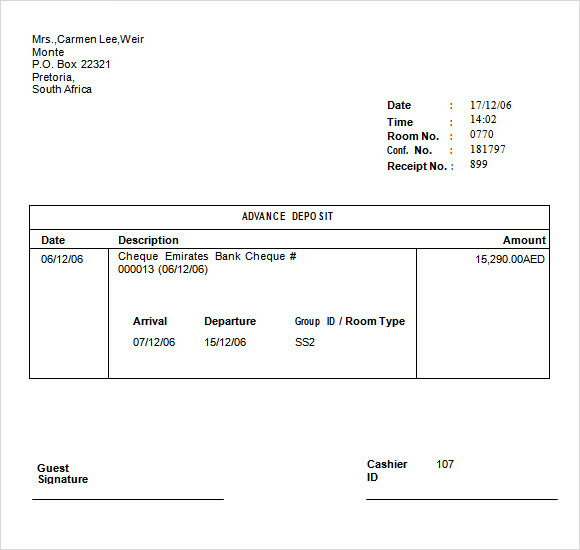 This template is perfect for the user to mention the various details and information that will be relevant to the said deposit receipts. This template has a very neat and clean format. The look of the template is a rather formal one. The format of the template provides the users with spaces for various categories of information. All the sections of the template are very much editable so that the user can make changes in the various information inputs as and when required. 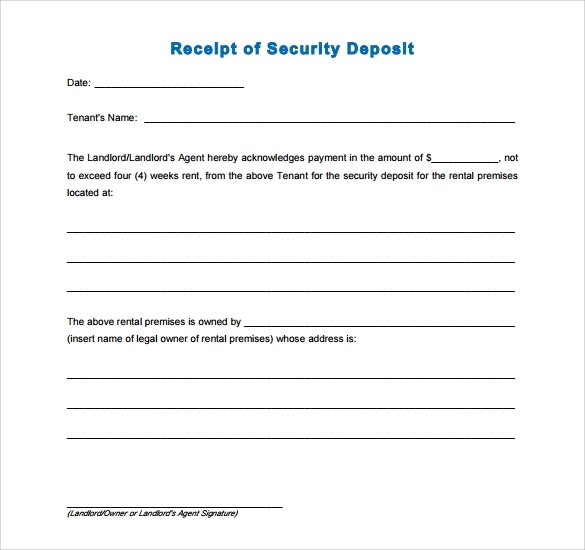 This template offers information such as date of the deposit and the person who is making the deposit. The name of the department or the group s also mentioned along with the space where one can mention the phone number and the email address. The template layout also mentions the source of income and the amount of to be deposited. The template also includes the space for instructions. 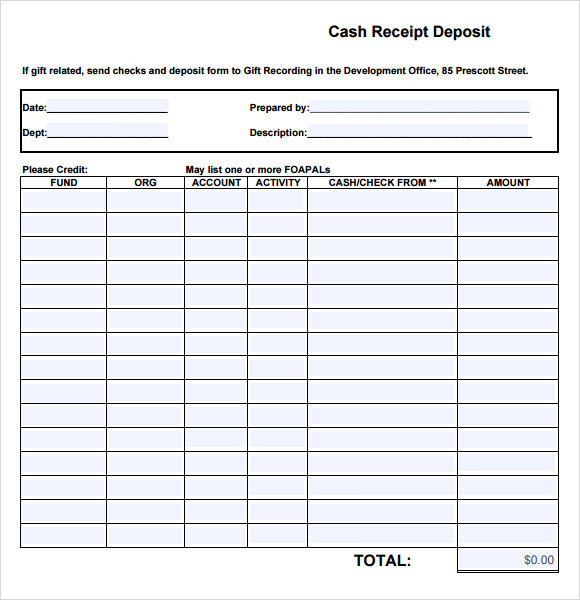 What is The Sample Deposit Receipt Template? 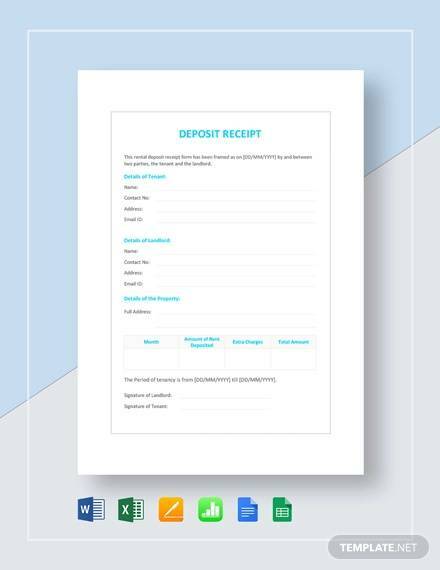 This sample deposit receipt template can be of various layouts and creates perfect options that will be record the details of all the monetary transactions. This template can be of a very high use to the banks and other financial institutions. 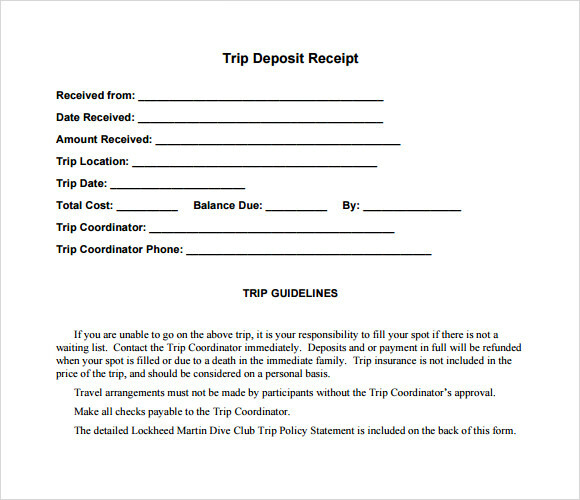 How to Create a Sample Deposit Receipt Template? Creating a template and provide all the required details pertaining to the monetary transactions. Keep all the spaces that will contain the details fully editable. The template can resemble an actual ledger. 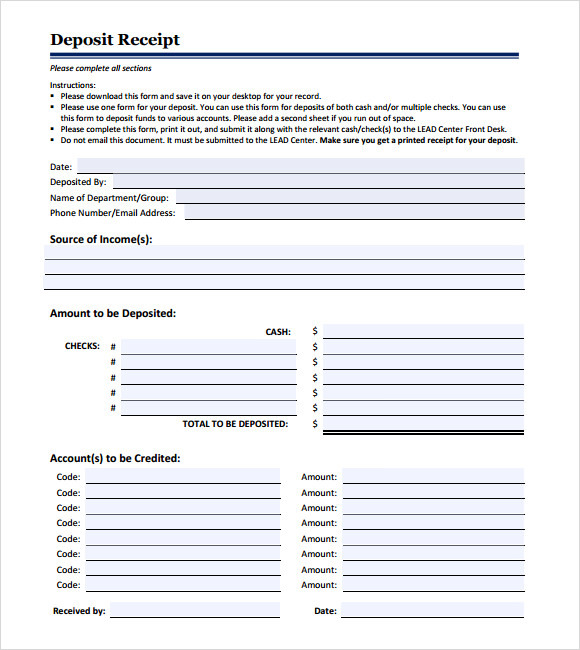 This template helps you keep a record of your earlier monetary transactions. This template can help you get an account of your monetary inflow or outflow. Conclusion: Be it a deposit receipt for rentals or deposit towards car sales, you can use these printable deposit receipt formats to let you have a record of deposits done towards a specific purpose (Refundable or non-refundable). The templates work as a proof, in case of issues arising later as they have signatures of both the parties involved.